Finding a tick on your cat can be worrisome if you don't know how to remove it. Even worse, you can try to remove it improperly and leave the head still attached to your cat. According to veterinarian Dr. Megan Teiber, "It is safe to remove ticks from your cat at home as long as you are comfortable with the procedure and your cat is cooperative." The procedure to remove a tick is quite simple, assuming your cat is easily handled and calm and you know what you are doing. It's also important that you are calm and confident as you don't want to stress out your cat or yourself if you are bothered by insects. The first step is to get a tick-remover tool. Most vets should carry them, particularly in areas known for ticks, or pet stores carry them as well. You can use tweezers, but they do not work as well. If you know that you live in an area where ticks are a risk, you should purchase one ahead of time to have it ready. They can be purchased for as little as $3 and are usually made of plastic. There are three things you should be aware of before you start. You must not put too much pressure on the body of the tick. This can make the tick spill blood onto the cat which can cause disease. Second, you must make sure you do not allow the head to stay attached to the cat and remove only the body. Ticks stick their heads into a cat's skin, so it takes some finesse to remove them intact. Third, you should protect yourself by wearing gloves or using a paper towel or rag. 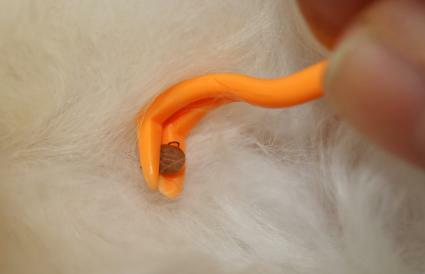 Take the tick tool or tweezers and grasp the tick's head by sliding them under the head, against the skin. Pull the tick out in a slow, steady motion. You want to have a good hold on it without squeezing too hard. Do not twist when moving the tick out. Don't worry if this takes a minute or two to get the tick out completely. Once you have it out, put it in a jar or dish of rubbing alcohol. This will kill the tick which is vital as the removed tick can continue to move and seek a new host. You can clean the area where the tick was attached to your cat with some triple antibiotic ointment. You can also clean the area with some antibacterial soap. Another step you should take once the cat is free of the tick is to speak to your veterinarian about tick prevention. Your veterinarian can prescribe Revolution, or Frontline Plus to keep your cat tick free. Use a match to burn the tick. This doesn't work and can make the risk of disease even higher. Use ointments, salves or other treatments to make the tick leave your cat on its own. Popular myths promote using petroleum jelly or alcohol which do not work and can increase the probability that your cat will get infected. Pulling too hard, squeezing the body or twisting, which can leave the tick's head buried in your cat. Smush the tick when it's out as this leaves a risk of disease for you and your cat. 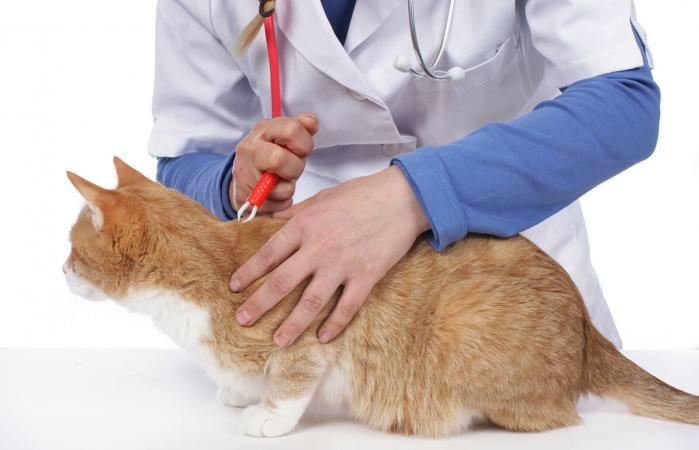 Dr. Teiber explains, "If your cat does not like to be handled and is too wiggly or becomes aggressive, it is safest to take him or her to the vet for proper restraint." It also is a good idea to bring your cat in if the head gets stuck in the body. Leaving the head in is not necessarily dangerous, but there is a slight chance that it can increase the risk of disease. If the area develops a rash or becomes very swollen and irritated, you should bring your cat in for an examination. It's not abnormal for this to happen as the wound heals over the course of several weeks, but it should be checked out, nonetheless. As long as your squeamish, your cat is calm, and you are armed with the proper steps to remove a tick, you should be successful removing one on your own. If you have any concerns at all, contact your veterinarian for assistance.